The 2004 transit of the planet Venus, the astronomical event of the year, was visible in the early morning hours of June 8th from most of the eastern United States. The last transit occurred in 1882 and the next will occur in 2012, after which Venus will not pass across the face of the Sun again until December of 2117. A fine website from NASA provides much additional information of interest about past and future transits of Venus. Transit of Venus as seen from Middlebury College in Vermont, 8 June 2004. Photo by R.J. O’Hara (whose hand appears at the side). 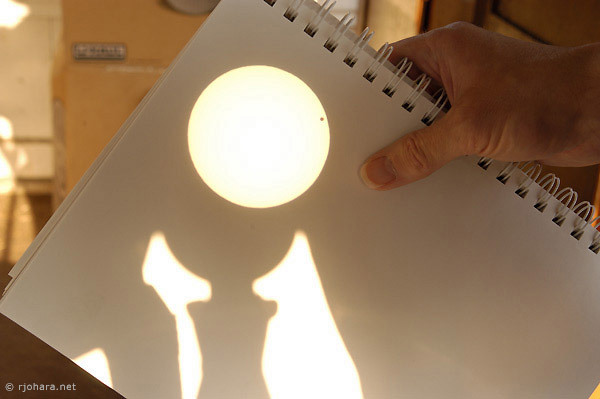 The solar disk is being projected through a small Bausch & Lomb telescope onto a sheet of paper. The shadow of the scope and its tripod are visible below the image of the sun.